I adore everything peanut to do with peanuts. Everything. In my eyes they're the average Joe of the nut world, but they manage to be sensational when it comes to roasting them, grinding them up, adding them to bakes, and (I think you know where I'm going with this, but hey], they're particularly good when they're coupled with chocolate. Ah, that's what she was getting at. Yes. Peanuts and chocolate, much like hazelnuts and chocolate, are a pretty sweet combination. 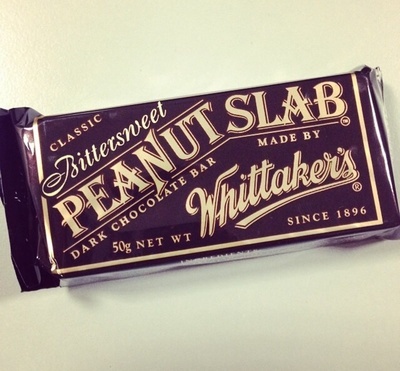 I know because my friend recently returned from her travels around America and she bought me back this rather special bar, by Whittakers, called a 'Peanut Slab'. It sounds kind of epic and that's because it is. This slab of chocolate is an uncut, rectangular shaped, thick bar which has been studded with broken up pieces of peanuts. If you're a a fan of salted caramel, then you'll find there's a similar quality to this bar because the peanuts have been lightly salted. This adds a depth to the chocolate, one that I am only too partial to. Salt, peanuts and dark chocolate go together incredibly well. Find this online and you will truly thank me for it. Don't worry, it was my absolute (chocolate-filled-face), pleasure.